I’ve been awful at updating the blog for a while, but that doesn’t mean that my journey hasn’t continued. To be honest, sometimes it takes so long to walk everywhere that I just don’t have time to write a post about it. (But most of the time I’m just lazy). I’m not sure I can even explain why I love it so much other than I just love the sentiment that what happens in our heads and hearts is real and important and can change the world. There are a lot of really amazing quotes though. Now that I’ve finished HP, I am now starting to listen to Lord of the Rings! I’m starting with The Hobbit, of course, which is exciting because I’ve only read it once and it was back when I was in High School. One thing I’ll be doing differently is that I can only listen to these books if I’m actually walking. It’s already been helpful to get more miles because I want to listen more. I started over the weekend and I’ve just gotten past the point where Bilbo meets Gollum and finds the Ring. There are a lot of things in this world that are unknown or scary right now. Sometimes it’s good to be reminded that the only thing to do is go forward, even when we are scared. So on we go! On my mileage I am halfway between Rivendell and Lothlorien, which means I am just 50 miles away from the mines of Moria (spooky music)! Great progress so far and I’m pretty excited about it (even though it is very slow going). 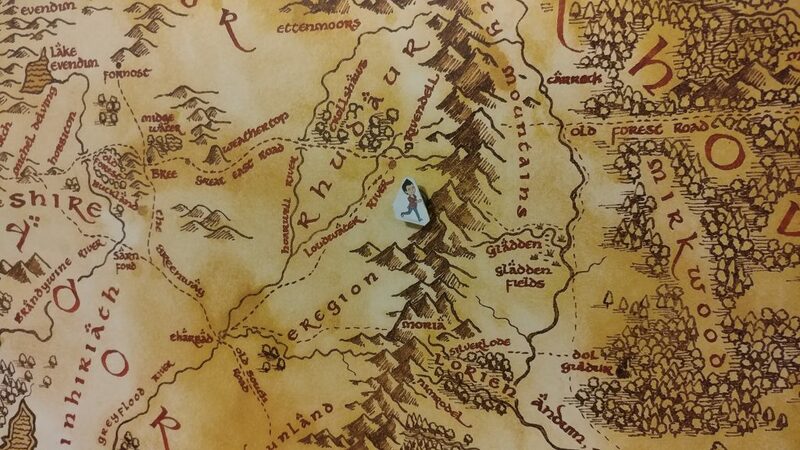 I even got to move my figurine on the map today! Listening to: The Hobbit on Audible. Next Post: April 11th – 1 Year In. Leaving Lothlórien. Copyright © 2019 One Day At A Time . Powered by WordPress and Drop Shipping.